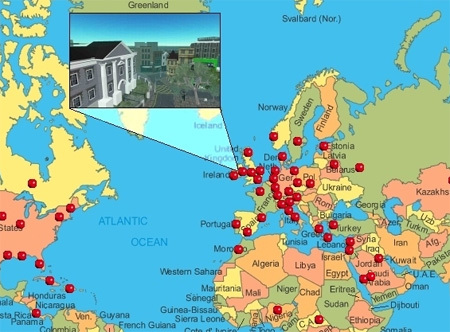 The UK company New Business Horizons has created what looks like the most comprehensive map of real world places re-created in Second Life I've ever seen. They have both a web-based graphic that you can click on to get teleport links to the sites in-world, as well as an in-world map with the same information. You can find a lot of well known places like virtual Dublin, Morocco, Cuba and Amsterdam. Plus, there are lots of surprising entries in here including Nigeria, Mauritius, the Dominican Republic, and Belarus! I did noticed one glaring omission: the Philippines! Otherwise, this is super impressive. Is there no other similar map? This one is very empty/incomplete. A zoom would be a good thing for crowded areas. I appreciate the effort, but I’m surprised that in 2009 no one has done a Google Map mashup of the hundreds of sims and builds which mirror, more or less, RL locations. A Google Earth layer, with Slurl capability and links to the SL Wiki and Flickr groups would be amazing! Someday, for sure. the problem is that whatever map you build gets dated pretty quick, given the mercurial nature of SL. I have lots of sims in my “real world places in SL” category that I’ve blogged about that are just memories now. I’d still like to see one. Would be loverly if someone with the time & inclination would keep a mashup updated, with help from readers, of course. Hi Rik – thanks for mentioning the Map of Real World Places in Second Life which we try to keep up to date as a service to the SL community. We ask on our website and on the map itself in SL for anyone to suggest places that should be added to the map together with the LMs/SLURLs. I’ve picked references to the Philippines and Belize in your blog which we’ll research and welcome any other suggestions. They have both a web-based graphic that you can click on to get teleport links to the sites in-world, as well as an in-world map with the same information. I have a website aswell.